What if I do nothing? Your current elections will remain the same. You and your dependents will remain enrolled in the Plan you have currently elected. When do I need my changes in this year, with necessary documentation? All forms must be completed and returned to Stacey Cockroft by 4:30 PM on or before Friday, December 14, 2018. When is the next time I can make changes if I don't act by December 14, 2018? 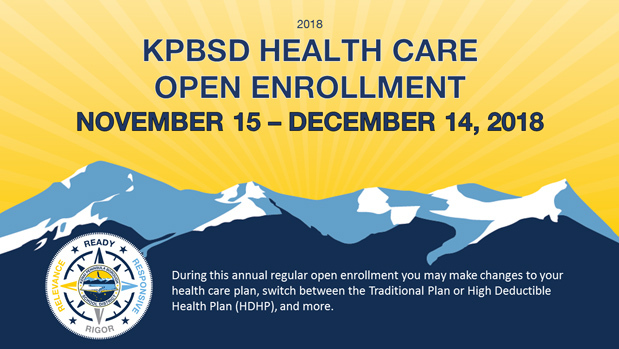 The next open enrollment will occur November – December 2019, unless you experience a Special Enrollment (Qualifying) event, as described in the Summary Plan Description. How-To details For specifics about the Health Care plans, enrollment, or documentation needed to enroll a new dependent or decline coverage, refer to your email from Stacey Cockroft, Employee Benefits Manager, the information packet that was emailed to every employee, or visit the "Health Care Coverage" section on the KPBSD website, in the Employees section: http://bit.ly/KPBSDemployees and review the forms and information provided in the Open Enrollment 2019 section.